A once-thriving agricultural center, Arcadia was established in northern Oklahoma County soon after the 1889 Land Run into the Unassigned Lands. Situated approximately seventeen miles northwest of Oklahoma City, Arcadia developed in southwestern Deep Fork Township where the fertile land around the Deep Fork River and its tributaries attracted cotton farmers, both white and African American. Early settlers apparently chose the name to reflect the area's quiet, peaceful nature, Arcadia being a region of Greece famed as a rural paradise. A postal designation made in early August 1890 named Sarah J. Newkirk as postmaster. In 1902–03 the Missouri, Kansas and Texas Railroad constructed a line from Bartlesville to Oklahoma City, passing immediately south of Arcadia through William H. Odor's property. Rail access quickly transformed the new town into an important regional market, and the Arcadia Townsite Company, established by Odor and others, developed two plats in 1903. In 1904 the Arcadia Star claimed a population of 800 for the town, but in 1900 the U.S. Census had recorded only 706 in all of Deep Fork Township and in 1907 recorded 994. While Arcadia remained predominantly white, census manuscripts reveal that Deep Fork Township's population remained approximately 50 percent African American for decades. Businesses that thrived in the early years included A. H. Crabb's Pioneer Mercantile and cotton gin, B. F. Ogle's Up-to-Date Grocery, Odor and McMinimy Hardware, Sweat's Restaurant, and F. C. Dowell's Arcadia Hotel. By 1910 residents supported three churches and two schools, one for whites and a "separate school" for blacks. By the 1920s Arcadia had telephone service, two banks, seven general stores, and two cotton gins, as well as other enterprises necessary to a farming center. When U.S. Highway 66 was constructed from Wellston and Luther and immediately south of Arcadia into Edmond, the historic "Mother Road" brought extra income to the town's businesses. Part of the roadbed was listed in the National Register of Historic Places in 1999 (NR 99001424). In June 1924 a disastrous fire destroyed much of the business district, but one building that survived, Tuton's Drugstore, is listed in the National Register (NR 80003278). The Great Depression and World War II affected Arcadians just as they did the inhabitants of other towns, and people moved away to larger urban areas in search of work. Attempts to incorporate in the 1930s and in 1980 failed, but after avoiding annexation by Edmond in 1984–85, incorporation came in 1987. Since 1968 Arcadia students have attended Oklahoma City public schools. The 1990 census recorded 320 residents within the town limits. In the last decades of the twentieth century local residents and the Arcadia Historical and Preservation Society saved one of the state's remaining round barns. 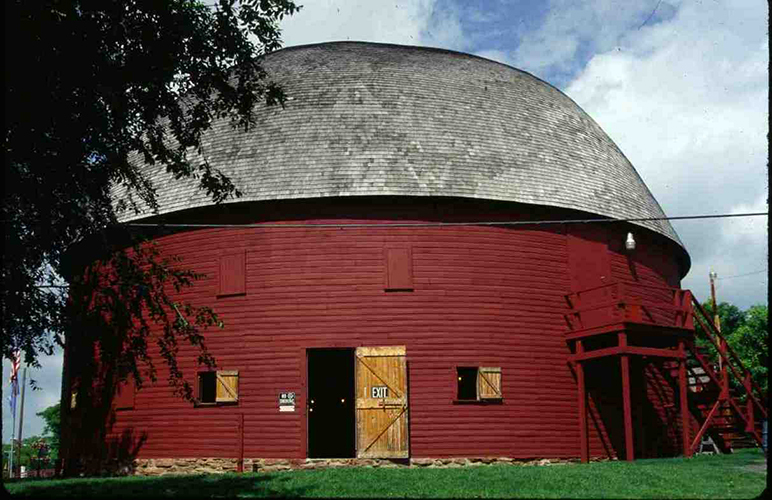 Originally built by William H. Odor in 1898, the Arcadia Round Barn was restored through the efforts of Luke Robison of Midwest City and is listed in the National Register (NR 77001094). In 2000 the population within Arcadia's 1.53 square miles stood at 279. In 2010 the census reported 247. Residents generally commute to jobs in the Oklahoma City area. "Arcadia," Vertical File, Research Division, Oklahoma Historical Society, Oklahoma City. Mike McCarville, "Arcadia's History Eventful," Oklahoma City Times, 22 August 1963. Bobby Ross, Jr., "Arcadia: Its Roots Run Deep," Daily Oklahoman (Oklahoma City), 19 November 1993. Dianna Everett, "Arcadia," The Encyclopedia of Oklahoma History and Culture, https://www.okhistory.org/publications/enc/entry.php?entry=AR005.